I don’t know where to start to say goodbye and thank you for all that you’ve done for our family. I couldn’t even say hello to you last time I saw you without crying…not once but twice. I guess like all things, I’ll start at the beginning. You remember how we first met? Howie was turning three. He had been in early intervention for occupational therapy under “clinical judgment” for sensory processing issues but did not yet have his autism diagnosis. You went into the private daycare that he was attending to evaluate him to see if he would qualify for services at our public preschool. Remember how he was on the verge of being kicked out of that daycare? After you went to see him there, we sat around a very small table at the preschool and we discussed Howie’s eligibility for special education services. While he didn’t qualify at the time, the preschool team all agreed to let Howie start at the public preschool that March so you could keep an eye on him. And keep an eye on him you did. You had me fill out the “Dunn Sensory Profile” and for the first time I was able to see quantitatively his sensory needs and differences. Questions like “does your child hug too tightly” or “does your child spin” were now indicators of sensory processing issues and not random unexplained things that my child did. You taught me words like “proprioceptive” and “vestibular” and explained to me what a sensory diet was in terms that I could understand. You consulted with Howie’s preschool teachers as we tried to figure out what was going on with him. This wasn’t something special that you did just for us. This was just what you do. Remember when Howie did get his autism diagnosis at age 3 ½? That now we had a place to start with an IEP and goals and ways to help him? You were right there at his first IEP meeting to bring him on for direct services for fine motor work as well as a consult for all things sensory for him in the classroom. You gave me ideas for equipment and exercises that we could do at home to help him regulate. You introduced him – and me – to the How Does Your Engine run program and worked with him on his handwriting, his tune ups, and classroom fidgets. You were always willing to try new things and look at his programming from a sensory perspective, and never once dismissed an idea that we had to help him. The incredible wealth of knowledge and experience that you bring to the table when working with a student and their family is extraordinary and we benefited from that immediately. You never once looked at the “autism” label and implemented a cookie cutter OT program around that label. I didn’t know it at the time, but I know now how seamlessly you worked with the whole preschool team to teach self-regulation, handwriting without tears, and fine motor skills. You were part of my oldest son Gerry’s preschool programming and I didn’t even know it. With your wealth of knowledge and experience comes this incredible way of predicting the future needs and successes for children. Remember when Howie “graduated” from direct service with you in kindergarten? Remember how I panicked? You called me and reassured me that he was ready and you wouldn’t take him off your caseload if you didn’t believe that to be true. Sure enough, Howie’s handwriting is better than everyone else in the family. You just knew he could do it. You believed in his abilities when so many others did not. With the reassurance that he was ready to come of your direct caseload, you promised that you would stay on as a consult for his sensory diet. 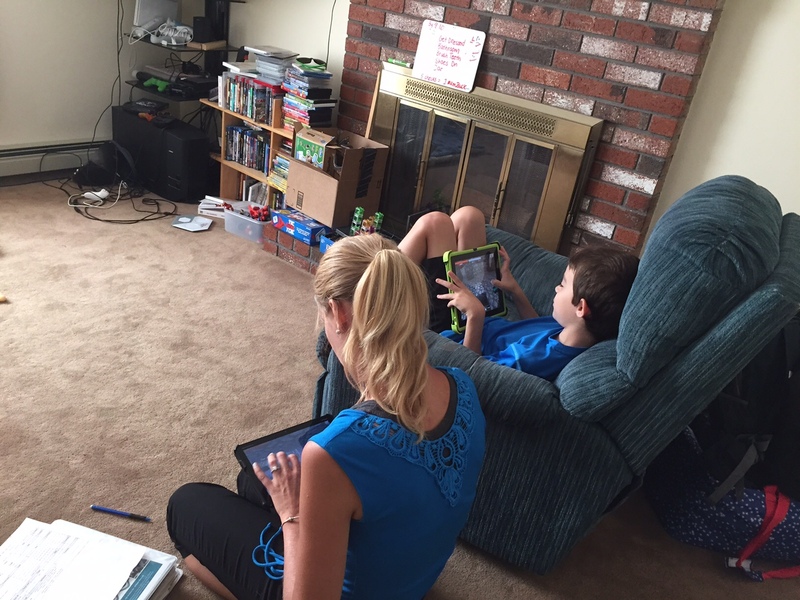 You created specific sensory and self regulation/advocacy goals for him in his IEP. 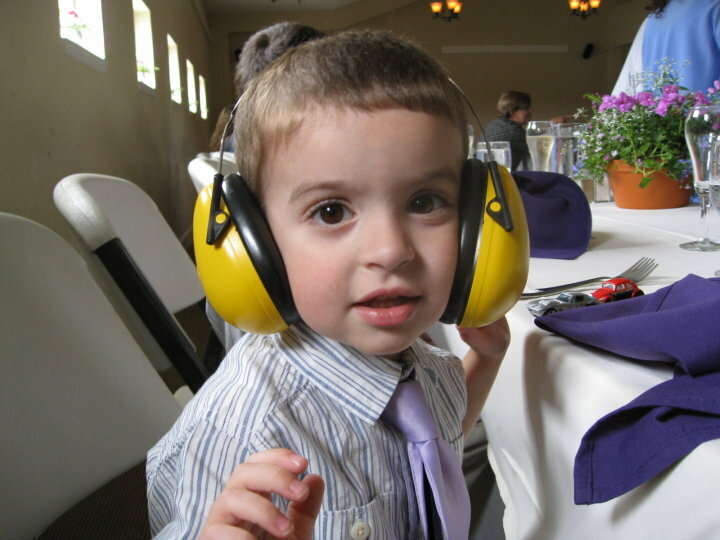 At this point in time, Howie was having a particularly hard time not only with sensory overload at school, but with learning what tools could help him “feel better”. You called me to say you were creating a sensory tool box for him to have in his classroom and asked for my input into what should be in there. You worked with me, his teachers and his aides to help teach Howie what he needed and how to ask for it. You never let him flounder. You were always there to make sure he got what he needed to make it through the day. I remember so clearly one IEP meeting when Howie was in first grade. I expressed my sadness and worry over his struggles and his inability to figure out what he needed. “Just wait until he’s 8 or 9 years old,” you said. “You will see tremendous growth not just in understanding and coping with his environment, but also in his ability to ask for what he needs to cope with that environment.” You were absolutely right. At our third grade IEP meeting, most of his self advocacy goals had been met. You never said “I told you so” at that meeting, but I know you were thinking it with a smile. And now here we are. Your retirement. You have been with us from preschool through the start of this year in fourth grade. You have watched my child grow in ways I never could have predicted (but you did). You listened to every single concern I had along the way and addressed them. Your institutional knowledge of my child has been instrumental in his successes and in helping him get the accommodations and services he needs in the classroom. Your kind and gentle manner has guided him and me through the darkest of times. You saw things in him that no one else did. You changed his classroom to fit him and never once asked him to change to fit his environment. You taught his teachers what his movements and mannerisms and outbursts were trying to tell them. You believed that behavior is communication and you looked at his world through his eyes to see how to help him. 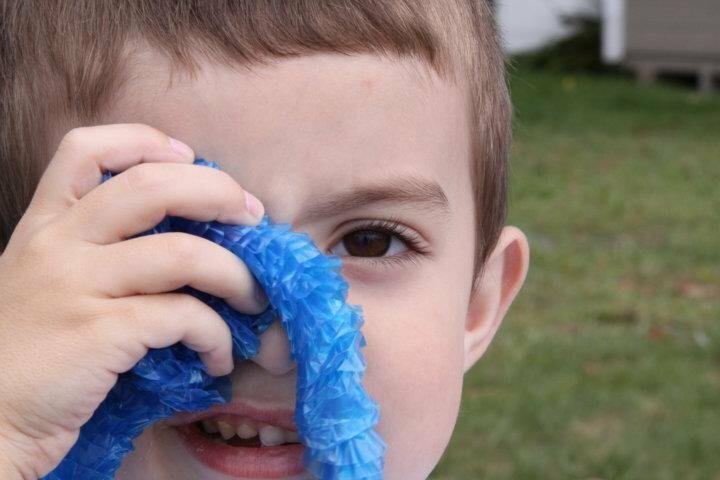 Everything that I now understand about sensory processing issues and autism, I know because I learned it from you. I am grateful every day for what you taught Howie, his teachers, and our family about our sensory issues. And I thank you for helping us embrace and not fight his unique way of interpreting his world. Have a wonderful next chapter as you head off into retirement. You will be missed, but never forgotten. I was in the living room trying to keep the new dog out of the way of Howie’s home therapy session, when I heard him say this. It’s his last time with his beloved therapist Miss R. She’s been with him – with all of us – since November of Howie’s kindergarten year almost four years ago. She started the week when everything fell apart for Howie at school. The week when I looked around the table and said “we’ve all failed him here”. Miss R gave her notice two weeks ago. Howie didn’t react well to the news when I told him over the weekend. He got very quiet, asked who his new teacher would be, and then walked away from me to sit with the dog. I listened to them as they talked back and forth about Howie’s Minecraft world. He had created the account for her a few weeks ago so they could play together at the end of their sessions. Howie took her step by step through all the iPad controls, and taught her how to move, how to dig, and how to place blocks. I sat on the floor in the other room playing tug of war with the dog and his rope, and I tried not to cry. There’s not enough thank you card space to express what you’ve done for Howie and all of us these four years. Thank you for helping him when he would only eat four things. Now he eats Thai Hot Pots and tacos from Chipotle. Thank you for taking his “enthusiasms” and working with him, not against him. Thank you for drawing parts of Hot Wheels cars every time he took a bite of food so he would eat. Thank you for encouraging his invention sketches as part of his homework. Thank you for using and playing Minecraft to work on his conversation skills. You never once disparaged them as “obsessions” to ignore and replace, but rather as a tool for connecting with him. Thank you for working with Howie when he couldn’t sit for one minute to do his homework. 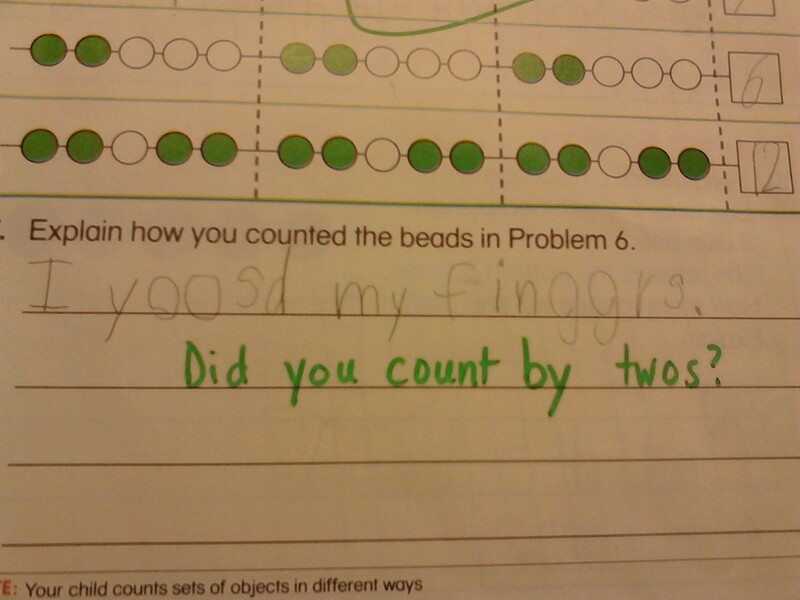 Now he completes the worksheets in five minutes. Thank you for scribing sentences and for working through third grade word problems with him. Thank you for playing games with Howie when losing for him was so hard. Now he says “good game” and moves on. 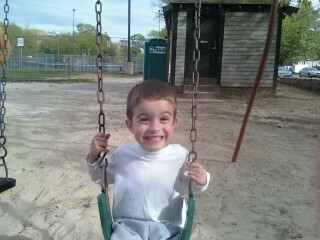 Thank you for teaching him how to swing on the swings. And thank you for all the “underdogs”. Thank you for waiting him out when he needed space. And for knowing when he was all done. Thank you for coming school shopping with us. And to restaurants. And the park. 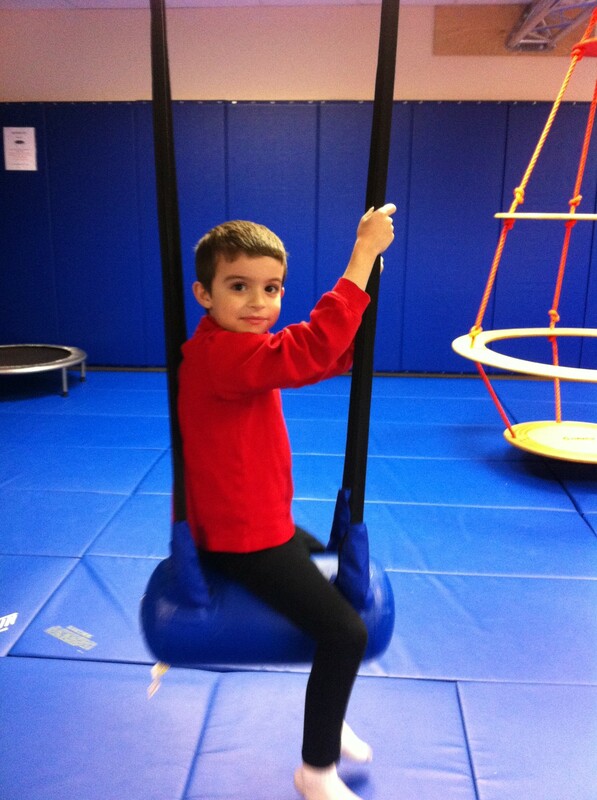 And the sensory gym. Thank you for implementing a “Howie” program and not an “autism” program. Thank you for being there when our dog Rocko died. And now when the new dog Newton came home. Thank you for building a trust with Howie. And with us. Thank you for believing in him. Thank you for calling him a hero and helping him show the world what he can do. At five o’clock, Miss R turned to Howie, handed him back the iPad, and said it was time for her go. I called him over and handed him her goodbye gift to give to her. This morning before school, Howie looked up at the white board that I use daily to tell the kids their schedule for the day. “It’s Wednesday. No more Miss R on Wednesdays.” Howie said quietly. ed note: I’m departing from my usual song title today to share a poem written by my oldest. He didn’t write it for Autism Acceptance Day. But it’s a perfect poem for it. And I’m incredibly proud of him – not just for writing it, but for believing it and believing in his brothers and the members of their autistic village. Last Sunday, I finally broke. It was about 8:45am and I was leaving for work. Gerry was in the car with me. We only had a couple of inches of snow fall the night before which in the grand scheme of all things winter wasn’t a lot. Tim had shoveled the driveway at midnight so it was clear. The plows, however, had come through early that morning and created a crusty, slushy pile about three inches tall right along the edge of the driveway. Just the perfect consistency for me to get my car stuck. I haven’t been stuck in snow in my car in years. I grew up in Vermont. I got my driver’s license in the dead of winter and have been in every possible bad weather driving environment. The last time I was stuck was high school maybe? College? I rocked the car back and forth to get it free, shifting to reverse and first gear like I was taught. Still stuck. I got out and shoveled around the tires and tried again. My tires sank deeper into the muck of sand, snow and ice. I got out of the car and went into the house. I was choking back tears at this point. Tim came out and shoveled around the car. 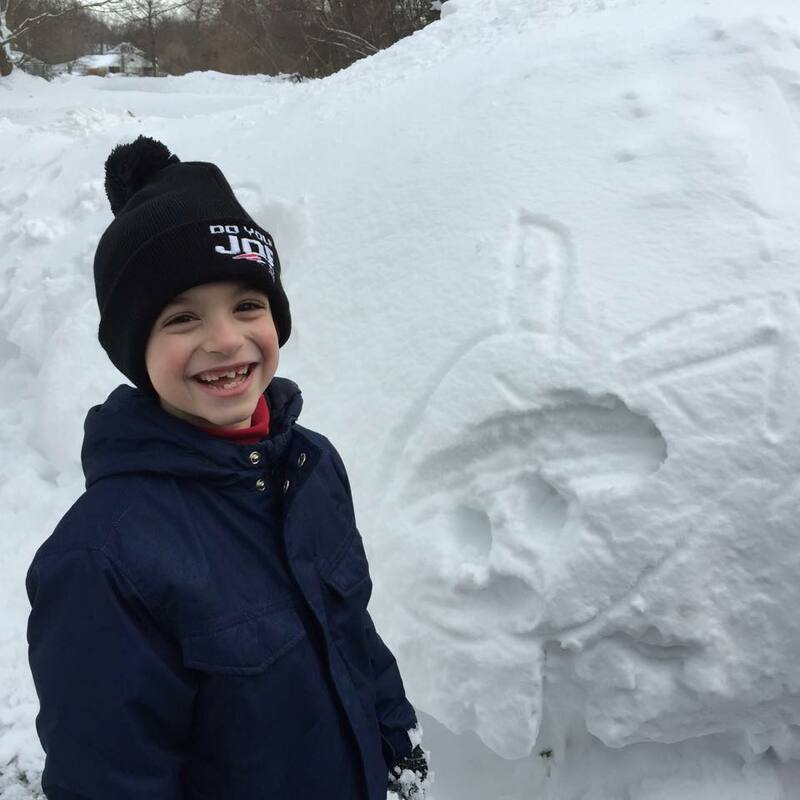 He did the shifting gears thing to rock the car and shoveled some more. The wheels spun and finally broke through. I hopped back into the car and with Tim out in the road giving me the all clear, I pulled out from between the seven foot snowbanks that line our driveway and sped off to work. “Are you okay, Mom?” Gerry asked. I’ve lived in New England my whole life and I have never experienced a winter like this. I’ve spent the last four weeks watching my mailbox disappear. My view of our road out our bay window is now obstructed by snowbank taller than Rob Gronkowski. My usual “hey it’s winter we will make it through” attitude has been replaced with anxiety, claustrophobia and complete weariness over what will come next. At first it was ok. Fun even. A blizzard! How exciting. We watched the weather forecasts and marveled over the drops in pressure. My human barometer ran laps inside the house as I watched the snow maps for our area change color to show a potential two feet of snow coming our way. 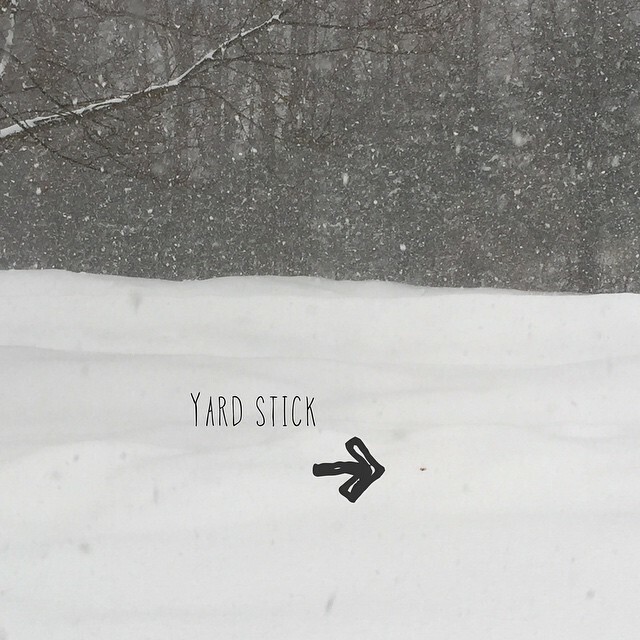 We stuck a yardstick in the snow to see how much we would get. I baked cinnamon rolls for breakfast. We watched movies and did crafts. 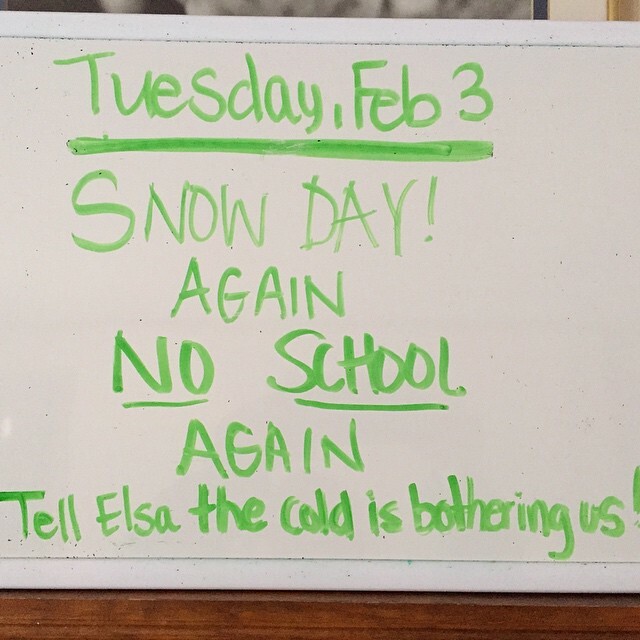 And then one snow day turned into two. Back to back and one week after the next. The forecast showed no break. Every storm was hitting us and we were in the target snow zone. The storms came one right after the other. The storms had non-threatening names like “Juno” and “Linus” but they came charged with high winds, snow, and freezing temperatures. Jim Cantore came to visit. With each forecast, my winter spirit broke. Anxiety kicked in for my kids. They would sit by the window and ask if school would be cancelled. Will we have a delay? Will they close? Is it safe for Dad to go to work? Will we lose power? If we lose power, will the fish die? When will they make the call? The questions would come in rapid fire. Until every phone would ring and the texts would come in that yes, school was closed for the day. Again. Before it sounds like I’m a parent who doesn’t enjoy being with my kids, these school closings aren’t just about the kids not being in school. We’ve had delayed, rescheduled, and delayed again IEP meetings. When Howie and Lewis aren’t in school, they are missing those services that we’ve so carefully crafted and fought for in those IEPs. If my kid happens to have lunch bunch or his social skills group on a Monday, he’s missed it four times. Their curriculum and routine is broken. Lesson plans are thrown out the window. Our home services have been cancelled. I rely on those plans to help my kids navigate their world and help me at home to work with my kids. Is this life and death? Not for us specifically but for so many it could be. The worry and fear is real. 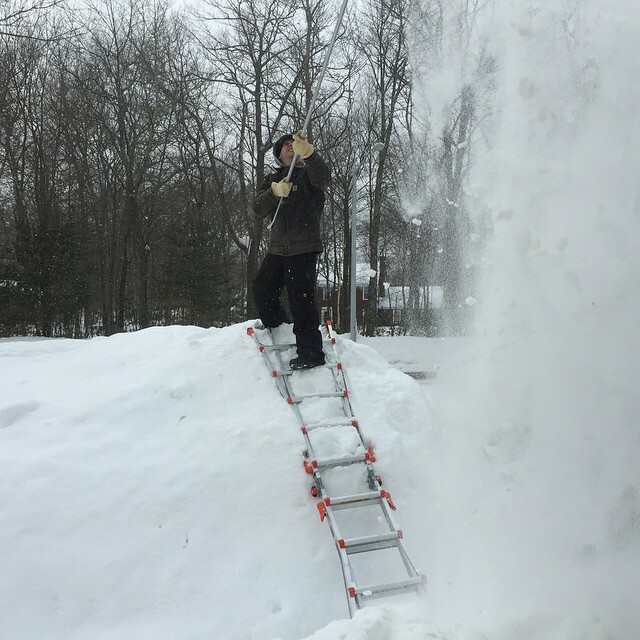 Tim spent seven hours clearing our roofs from snow to prevent a roof collapse. I have friends with buckets in their kitchens, bathrooms, and playrooms as ice dams have created leaks all through their house. At night, the house “pops” from frost quakes. There are power outages and dangerous driving conditions. My tiny small nonprofit business has had to close five times because of the weather. 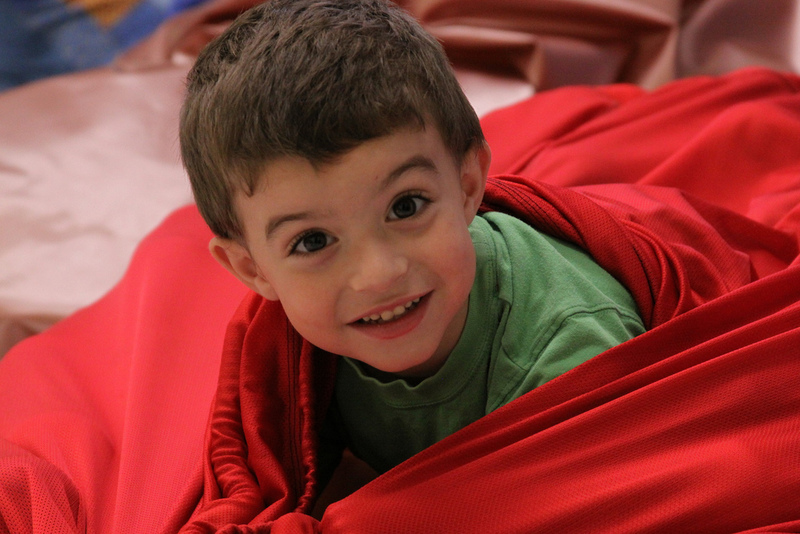 We are dependent on that revenue from families visiting our sensory gym to stay open. I haven’t slept through the night since the Patriots won the Super Bowl. Between the wind and the noises inside and outside the house and the “how am I going to make it through another snow day” anxiety inside my brain, there’s little calm to be had in my head. This is the first year I have actively researched schools and programs and real estate in Arizona. 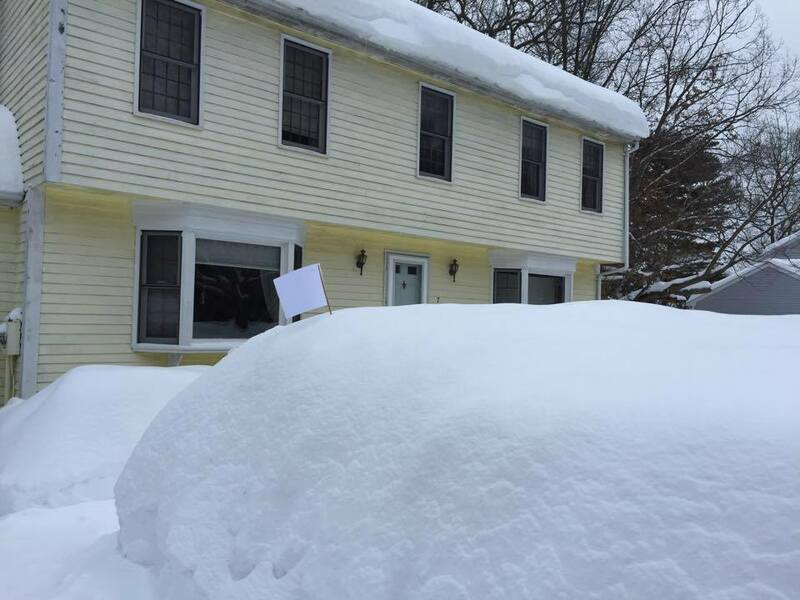 People say to me you’re from Vermont, this should be normal for you. And it’s true that the cold and the snow is what winter is here. But this isn’t “normal”. 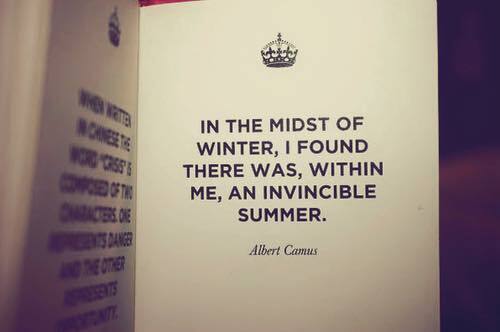 It’s not called a historic winter for no reason. And I am done. As I write this, it’s snowing again. Lightly. But it’s snowing. I know spring will come and there will be much joy in Mudville when the snow melts. But it will take a long time for us to recover – both outside our house and in our heads. Weaving time in a tapestry. It was a typical dinner Monday night when everyone was talking over each other and no one was eating. There was bickering. Potty talk. Anything and everything except actual eating. Since this happens quite frequently, I have a mental list of “conversation” topics that usually redirect everyone long enough to get some food into them in between sentences. When I say “conversation”, I mean mostly monologues of non-related topics, but each kid is taking a turn with it, allowing the others to eat. And when I say “topics”, I mean I ask them about Minecraft. So just one topic. Singular. “I would create a space world where things could explode!” replied Howie. “I would create a place where animals could go and there would be explosions!” said Lewis. I took my dinner out of the microwave and sat down at the table. I gave Tim a little smile. I was completely kidding. I half expected them to come out with a “What?! That’s ridiculous!” and go back to discussing how to explode creepers and zombies. Both Howie and Lewis were quiet for a moment. I sat in stunned silence. Howie’s eyes got huge and bright. Tim and I made eye contact. I gave him the “wow” look with my face. “Could you craft a weighted blanket?” asked Tim. “Oh yes, you could do that.” Howie replied. We were all giggling a little at the ideas, throwing them out one by one. “You could make a square ball pit with blocks and craft something to put in it!” Lewis exclaimed. But Howie was already gone and Lewis followed right behind. They went into the other room and pretended to be the autistic villagers, happily trading for fidgets. I cleaned up their full plates of food and turned to Tim. It was December 2009 when I was listening to the developmental pediatrician list off the “red flags” for autism that she saw in Howie. No pretend play, no ability to think of objects as anything other than their literal use. Focused on the spinning wheels of the car and not the car itself. Can’t do a pretend birthday party. It was August of 2011 when I heard the same thing for Lewis. I left the office each time with my view of the world and my boys tipped on its side. I was crushed – mostly by the guilt of what I didn’t see. What could I do to help him? Could I help him? Turns out my autistic villagers just needed to figure it out in their own time and their own way, through a game that has no boundaries except the limits of their imagination and creativity. Which, despite what we were told, seems to be endless. I’m looking forward to the day when they create this SenseAbility Craft Mod. I hope they let me play and be a part of their incredible, creative and imaginative world. Howie on the bolster swing. When I was a kid, I used to have these semi-religious, existential conversations with my dad about fate, free will, superstition and destiny. I would say I believed in fate, that some things were just meant to happen and meant to be. He would use his “frog in the pond” story on me, asking me if he told me that there was a frog in the pond who controlled everything in the world, would I believe it. I would always answer “of course not”. Which led to discussions of science versus fate, proof versus belief. Tonight, as the bases were loaded and I went back upstairs to my spot and put on my 2004 series winning pants and the inning ended, I would like the thank the frog in the pond for helping the Red Sox out of a jam. I’ve always been a superstitious person. I grew up believing in many of Jewish superstitions shared by my grandmothers. I remember how adamant they were that my mother not attend my grandfather’s funeral when she was pregnant with my sister. I remember a lot of “pooh-poohing” and spitting from my older relatives when I was a child. Even now, I have a small “Raggedy Ann” doll in the back of my car that has been in the storage compartment of every single car I’ve owned because I believe it keeps me safe. I have certain “lucky socks”, pants that I pull out for Red Sox World Series games, and I never drive on long trips wearing anything other than sneakers. When I was pregnant with my boys, I never had a baby shower and I dutifully tied a red ribbon on the leg of the crib for all of my children, whether they actually slept there or not. And I never, ever opened an umbrella in the house. Ever. Rationally I know that these superstitions aren’t based in any fact or science. However, why tempt the evil eye? When I became a parent, my belief in the need to “do things in this order or else something bad could happen” continued. If Gerry would fall asleep in the car wearing a certain coat, I would make sure he had that coat on each time I needed him to sleep in the car until it was no longer appropriate seasonally. I would cook his oatmeal for the same exact amount of time each morning before daycare. I would follow things in certain patterns to make sure the same result would happen. Most of this was probably sleep deprived induced behavior and not true superstitions, but I believed that I had to do some things in a certain way to make sure I got the same end result. Then came Howie and my superstitions kicked into high gear. Almost from day one. He had certain clothes that he would be happy in and if he wore anything else, he would squirm and scream and cry. I had to mix his formula a particular way or he wouldn’t drink it. And he had to nurse from side to side in a certain pattern or he wouldn’t fall asleep. He could only fall asleep on me, no one else. If anyone else tried, he wouldn’t sleep for the rest of the day. He had to be touching my skin to fall asleep. He had to sit in a certain place at the table or he wouldn’t eat. I had to give him a green plate. We had to watch one episode of “The Backyardigans” before bed. And then he would sleep in my bed so when he woke up every 45 minutes, he had me there to help him get back to sleep. I had to put socks on him at night or else he wouldn’t sleep. Until that “wore off” and we went without socks. Or he needed to wear certain pajama pants to bed. And then we moved to no pajama pants at all. He couldn’t wear any other pants but cotton ones with no buttons to school or else he wouldn’t have a “good” day. I had to give him his melatonin right before the shower, not sooner or later. Brush his teeth after the shower, not before. We had to snuggle in a certain way before bed or else he would be up all night. I had to warm up his yogurt smoothie in the morning for exactly 30 seconds in the microwave or he wouldn’t drink it. Then came the autism diagnosis for him. And for me a better understanding of the comforts of routines and the unsettling nature of triggers. These superstitions were my own creation based on his responses to his sensory needs – the patterns of “we must do this or else” were a reaction to what I didn’t understand. I didn’t know or understand why he needed socks worn a certain way, or why he could only drink a warm smoothie, or wear pants that were so tight they made a mark on his skin. I feared changing up the color of plates because I feared the meltdown that would come. I believed there was “some magic” in giving him the melatonin at a certain time and I thought that if we didn’t snuggle in “just this way”, all hell would break loose and we’d never sleep again. But I get it now. I know that he needs to feel comfortable in his clothes in order to get through the day at school or sleep at night. I know now that the warm yogurt is a sensory aversion to anything too cold to drink. I understand the comfort in sitting in the same seat at the table for dinner. These aren’t superstitions. These are genuine responses to known sensory triggers. With that knowledge also comes the ability to move from the rigidity of the patterns. After years of practice and tiny changes, we can serve food on different colored plates. “The Backyardigans” is no longer the show of choice before bed. He’s falling asleep in his own bed with me at the end of the bed, not tangled up snuggling in it. We no longer practice from a place of ignorance or fear, but one of understanding, acceptance, and the belief that these sensory issues are real and the routines are necessary for comfort and calm. There are times when I still catch myself falling into the superstition pattern. Last night, Howie put his pajamas in a different order than usual, with his tight bike shorts on over the tight compression pants that he wears to bed. I panicked for a moment, almost telling him that he will never sleep if his clothes are out of order because he has slept so well three nights in a row so changing it up would be disastrous. Instead, I reminded him that with the smaller bike shorts underneath the compression pants, he will feel a tighter “hug” on his legs which will help him sleep better. He smiled, changed his clothes, and climbed back under the covers. I’m working really hard to recognize the appropriate cause and effect to help my kids understand these their triggers and needs. However don’t expect to see me opening any umbrellas inside anytime soon. And my “Raggedy Ann” doll will always be with me. 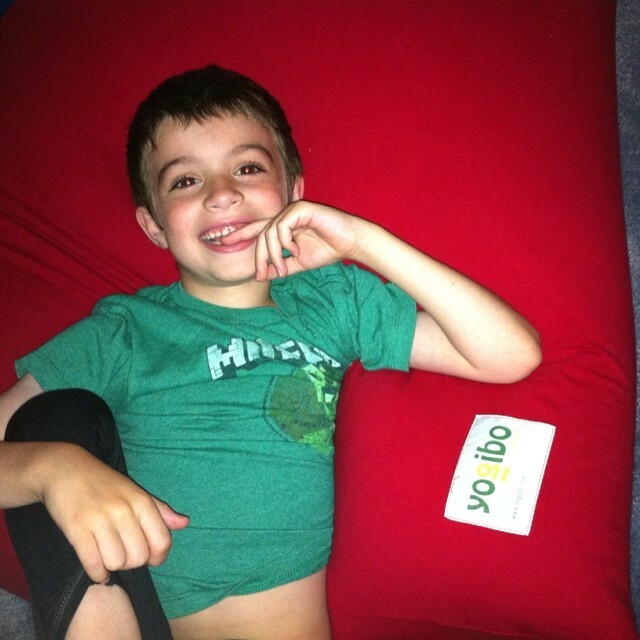 Chilling out in the compression pants and the Yogibo. We are sitting in Lewis’ kindergarten transition IEP meeting. As a team we are reviewing every service and service delivery to make sure it fits right for Lewis as he leaves preschool. It’s not my first rodeo and I have plenty of anxiety over the whole transition process based on past experience. 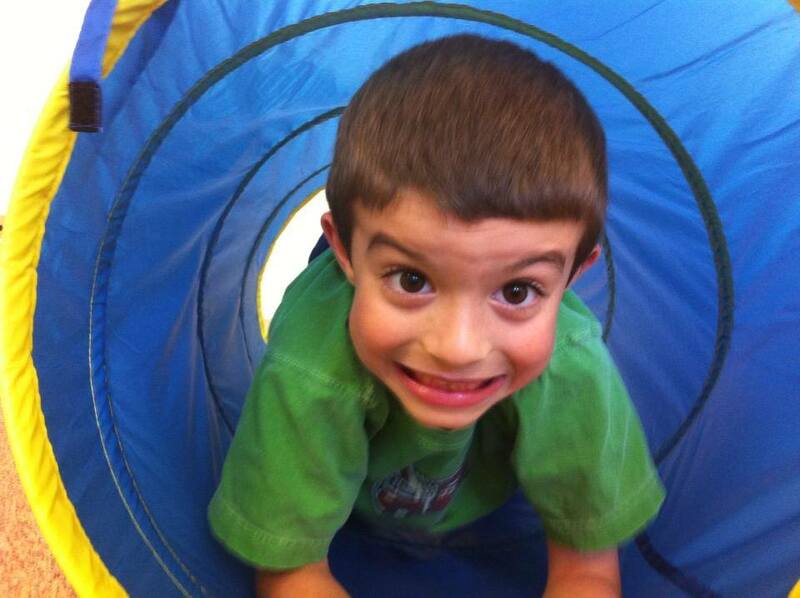 Lewis’ incredible preschool teacher and team know this – and know Lewis – and we discuss every detail to make sure we are all on board and understand how kindergarten will look for him for the new school year. We discuss his social skills programming, his need for visual and written cues when transitioning, his extended school year plan, and all the supports he will need for success. “So now let’s talk transportation,” says his teacher. I sit up straight in my chair, stiffening a little. “You’re pulling on your sleeves,” he says. That’s my “tell”. My sign that I’m having an anxiety attack. “It’s not that I don’t think he can’t be on the big bus. It’s just that…” I take a breath. This morning I sent a message to my friend Jess. A long time ago, that meeting would have made me sad. The big bus would have seemed like “The Holy Grail” of transportation. Going to school the way most kids do. Getting that big “first day of school” bus picture. I would have looked at it as one of my kids can ride the bus and one of them…can’t. My anxiety in that meeting would have focused on their disabilities in the negative, the kind of deficit model of looking at challenges and accommodations as a something bad and temporary with the hopes that maybe someday things will get better. I would have focused on the fact that I had one kid whose challenges kept him off the big bus, while both his big brother and little brother were able to ride it. But here’s the thing. I’m not that me anymore. Last school year, we took Howie off of the mini bus. He had been riding the mini-bus since kindergarten to and from school and it’s written into his IEP that he needs specialized transportation. But for second grade, I started driving him to school and he would taking the mini bus home. 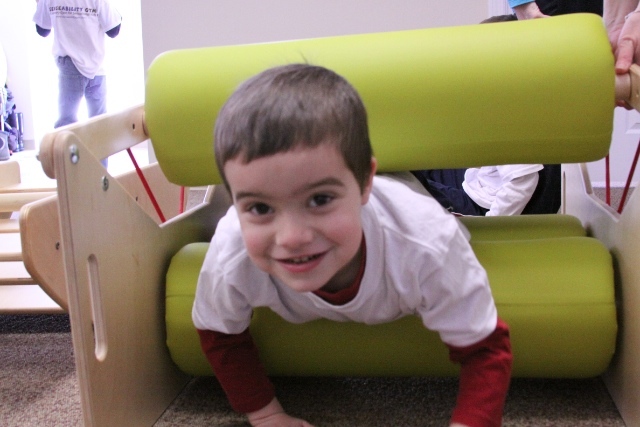 He needed a “sensory overload free” way to enter school in order to start his day off right. He didn’t want to talk to anyone or have anyone talk to him. About halfway through the year, that need for a sensory overload free trip became evident for the ride home as well. He would be able to use his calming tools to get through the school day, but have a very difficult time with that on the way home. 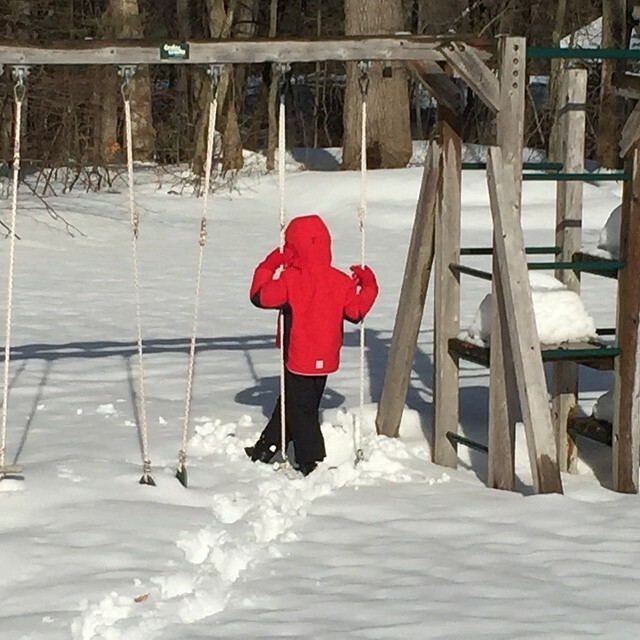 Once I began driving him both ways, his stress level leaving the house and coming home lessened greatly, spilling over to a better day at school and at home in the afternoon. It wasn’t that he couldn’t take the mini bus. Or even the big bus. It was that both of those choices weren’t right for him. For his success – academically and emotionally – he needed me to drive. This accommodation was no different than any of the other supports listed in his IEP. 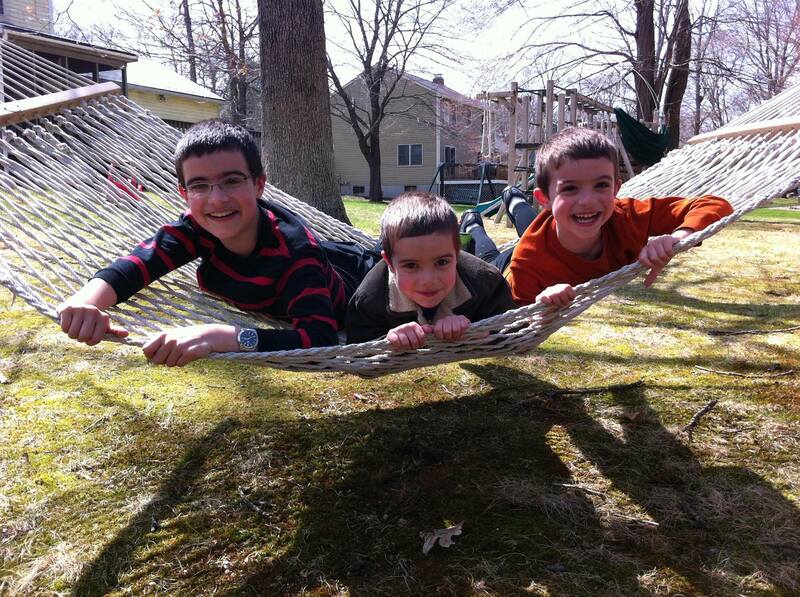 Two kids – two brothers – with the same autism diagnosis. Needing two completely different accommodations. But changing the question from “Can my kids do something” to asking “what is appropriate for them” – it made all the difference. All eyes of the team are on me. “I know that with a lot of prep he can. I think we should give it a try,” I say. I shift in my seat, pulling at my sleeves. We talk a lot in our house about fair not meaning equal. My kids have seen the cartoon of three characters of all different heights looking over a fence. They each have different sized boxes to stand on so they can see over the fence line. They aren’t equal sized boxes. Each character needed something different to get them to the same place. In our town, some kids walk. Some arrive in cars. Some take the big bus. Some take the mini bus. There’s no better or worse way to get to school. For my boys, there’s no stigma attached to any mode of transportation. My three kids need something different to get them to school. For one, it’s mom’s car. For the other two, it’s the wheels on the bus. 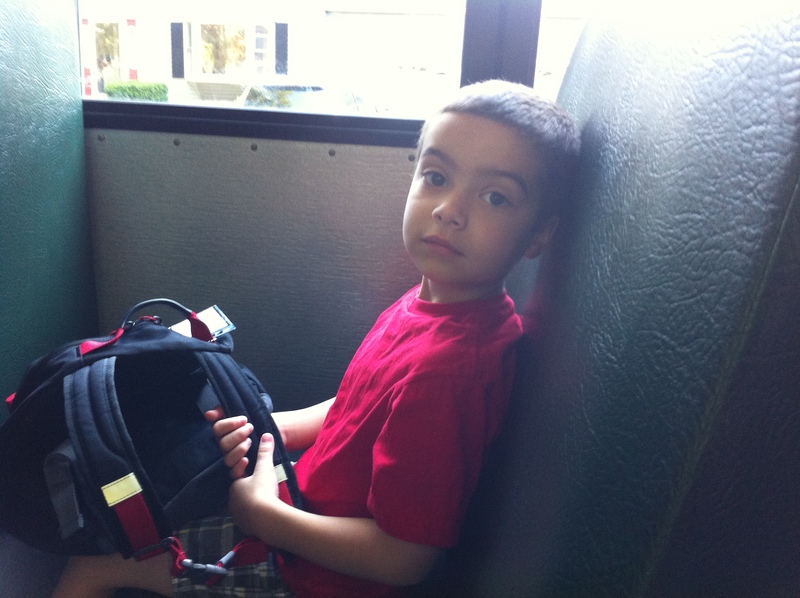 On the bus yesterday for kindergarten orientation. He did just fine. I'm in this book too! 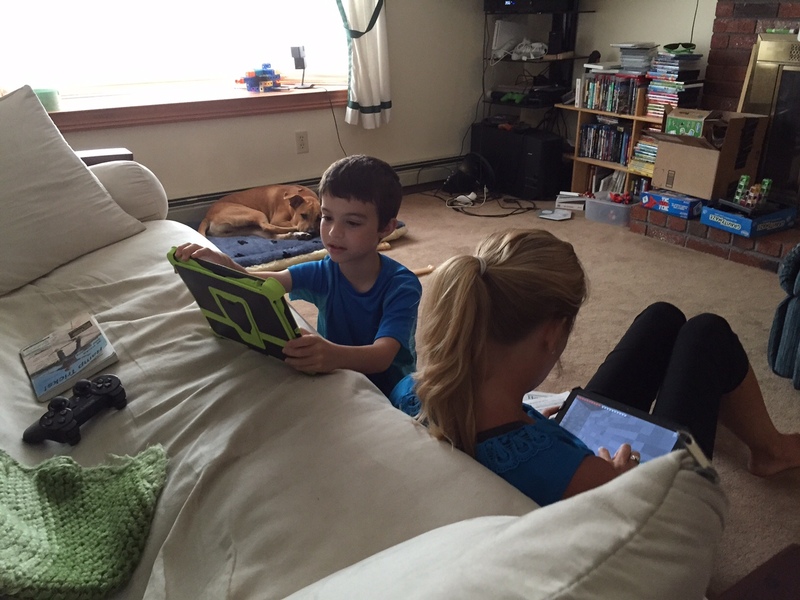 I’m a Boston Parent Blogger!